Eleven of the 15 Osage candidates running for Congressional office on June 6 must correct deficiencies on their first campaign reporting statements, according to the Osage Nation Election Board. Board members Terry Hazen, Belle Wilson and Chairwoman Shannon Lockett reviewed the submitted first campaign reporting statements on May 24 and voted for the Election Office to notify those candidates found to have deficiencies in their submitted statements. Once the candidates are notified of the deficiencies, they will have three days to correct any identified deficiencies, which include missing statement documents or incorrect or missing information on the statement forms. Election Supervisor Alexis Rencountre said all 15 candidates submitted their first statements by the May 20 deadline, which includes donations from individuals, corporations, LLCs or any business entity, whether organized by state, tribal or federal charter. According to the ON election rules and regulations (ONCR 15-19), the candidates are also required to open a separate bank account in the name of the candidate or candidate’s campaign, which all donations shall be deposited into for any and all campaign purposes. The campaign reporting statements must include bank documentation showing the campaign account deposits and deductions and the balance of funds at the time of the statement. 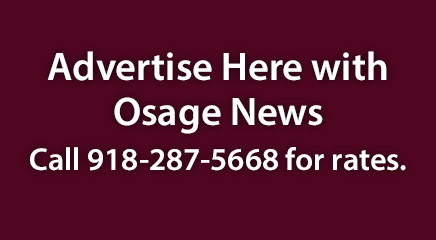 The Osage News has requested copies of the certified campaign reporting statements. The Election Board is scheduled to revisit the campaign reporting statement deficiencies on Wednesday June 1 after the candidates submit their corrected statement information. Lockett said the deficiencies are “very minor, we feel every one did a good job” in disclosing their campaign information, thus far. The candidates must also submit a second campaign reporting statement by June 24. The campaign reporting statement expenditures typically include costs for holding candidate meet-and-greets, mailing campaign literature, filing fees, purchasing additional voter registry lists from the Election Office, campaign yard signs/ banners, newspaper advertising costs and Election Day campsite costs. Rencountre said she would call and email the candidates of any deficiencies versus mail in prior election years to save on certified postage costs. Lockett said in the past, some candidates who were notified by certified mail of their statement deficiencies did not pick up their notifications. The Election Board reviewed the campaign reporting statements in the order they were received. Hank Hainzinger is the first candidate to turn in his campaign reporting statement on May 17 and the Election board deemed his complete for certification. May 19: Michael Bristow (deficiency), Archie Mason (deficiency), RJ Walker, John Maker (deficiency), John Jech (deficiency), Maria Whitehorn, Shannon Edwards (deficiency). May 20: Myron Red Eagle (deficiency), Rebekah HorseChief (deficiency), Danette Daniels (deficiency), Jacque Jones (deficiency), Brandy Lemon (deficiency).